The Benghazi Defence Brigade has announced that it has pulled out of Jufra airbase near Hun and handed it over the general chief of staff of the Libyan army (the army supporting the Presidency Council). It says it has gone to another location, but has not disclosed there this it. Meanwhile, reinforcements are reportedly being sent to both sides in the standoff at Tamenhint airbase, near Sebha, which Misrata’s Third Force which continues to hold despite a siege by the Libyan National Army (LNA) of Khalifa Hafter. The Presidency Council’s minister of Defence, Al-Madi Al-Barghathi yesterday ordered forces to move south to fight both the LNA and what it says are remnants of the so-called Islamic State in the area. The new operation, according to Barghathi’s spokesman Mohamed Al-Ghasri, is called Al-Amal Al-Muad (“The Promise of Hope”). Large reinforcements are also reported heading from Cyrenaica to the Tamenhint area. According to a resident at the nearby Tamanhint village, however, at the moment the situation remains unchanged at the base. Occasional small arms fire could be heard from around it today, he said, but otherwise the situation has remained relatively quiet. 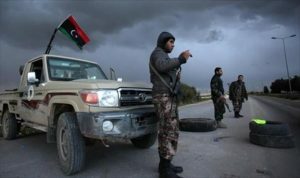 He did report, though, that a small unit of the Misrata’s Third Force unit at the base had moved out and headed to Jufra saying they did not want to be involved in fighting with the surrounding LNA forces led by General Mohamed Ben Nayel. On Wednesday, LNA aircraft and Ben Nayel’s forces launched a coordinated attack on the base, but it petered out after a short while. Local officials have repeatedly called on the two sides to continue negotiations and avoid fighting.